I was in seven minds yesterday. Out at the tip of the peninsula, it would be 14 m/s from S, just when I'm going to round. This morning the notice is lowered to 12 m/s, and there will be a "window" from 19 to 24 tomorrow when the wind is running off - so to go again. Then you can go there because it's bright enough around the clock. Had to get in the sleeping bag yesterday at 21:00 to get the heat (here is 10-11 degr.) And then I fell asleep. At 0.30am, I managed to make the night-toilette. In return, I was up 5.45 and to shower. The showers here are outdoors. Foreclosure on 4 sides, but no ceiling. It did not rain so I used the opportunity, but a cold pleasure when turning off the water. You just charge your phone for charging in the toilet building, where there is usually shaver plug. All does. I also do not lock the bike, for who would steal a bike in Iceland? Make my porridge at 7 and pack and then walk to the reception (which is also the reception for the golf course), which opens at 8am and have a cup of coffee and a little warm and writes while I eat the two cheese mites I brought . I do not know what I expected, but it is magnificent. The landscape. 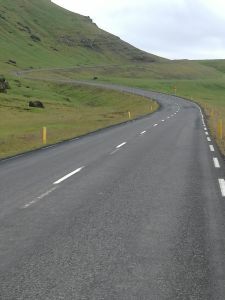 And the road is asphalt, so I do not get to all the small tight climbs that can kill one. First of all, I have the pleasure of catching an icelander on bike. It turns out to be a girl who does these 11 km each day. She points out the local heating plant. Just a small house where the wells are and then it's just like one-way district heating. Some places it blows from the mountains, otherwise it's very quiet. And then there are all these lagoons in the area that the cloudy mountains can reflect on. 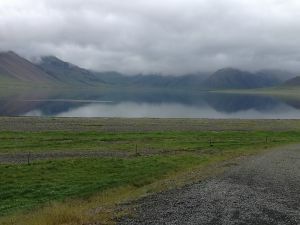 In Grundarfjörður I have heard that there should be a good info. It turns out to be a combination of info, cafe and library. I ask the young man impossible questions. About electricity, about cables, about license plates. He suggests that I try at the police station about the latter. I will do that. 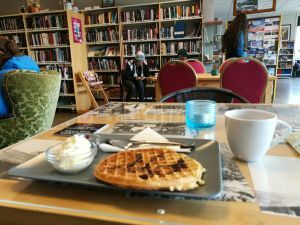 Then I eat Icelandic waffles and drink coffee. It's a nice break I have here. There are a lot of young people who all sit with their mobiles - it's like being at home in the S-train. They are czechs I think. There turns out to be a "cinema", where you can continuously see pictures of the city's history. I'm sorry to go on .... When I get up, there's a young Spanish-looking man asking me if I'm the man with the bike? I must admit that. He is Colombian, but the girl he is with is a Spaniard. They both cycled alone, but now they are following on so far. We all 3 set off, but I have to go to the police station so they will lie in front of me. As he said, the Icelander in the info, they have nothing else to do. And he has been right. The police lady is talking privately on the phone, so when I've stood there for a while, she's polite enough to interrupt the conversation. The combinations are random, she claims. Nonsense - nothing is random unless you use a random generator, but they may do that too? The young man in the info turned out to be able to speak Danish. He shows that when he hears, I tell the other two cyclists that I am a Dane. Have lived in Aalborg during his childhood. He is the first I have been able to speak in Danish. Can you find two small cyclists? 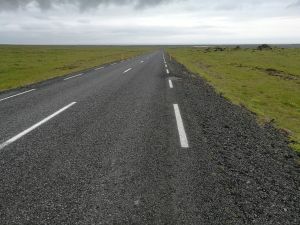 On my way to Olafsvik. I always have the two in front of me. There is a nice distance between them, and I think she's the one at the back. When I finally get up just before Olafsvik, it turns out that it is him. We talk the rest of the way. When he finds it hard, he tries to bring his inner Nairo Quintana forward. (best known Colombian cyclist rider - participant in the Tour de France) In his deployment, Quintana started his cycling career by living up in the mountains and working to take potatoes up down the valley. He drove home with 50 kg of potatoes every day. Upwards - on an ordinary bike. I decide to continue. 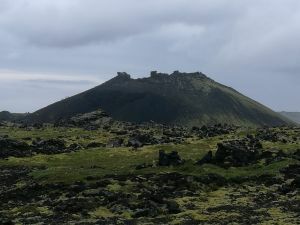 There should be 32 km to a campsite on the southern side of Snæfellsnes. There are still some very beautiful and varied surroundings in which I drive. I get to the last town before the national park and there, just as I have to drive up on a lava field plateau, I meet Sara. She turns out to be a Scot, so we have to reverse the situation in Europe, the United States and Scotland and Denmark, before we switch to the exchange of experiences. Such breaks are worth gold, but if there are too many of them, so you will not get anywhere. 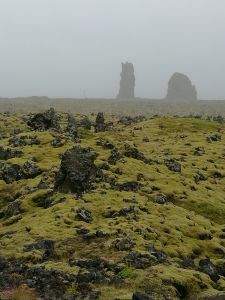 The entire west tip of the peninsula is relatively flat with a blend of North Sea landscape and lava fields. I think I'll arrive when the counter is 112 km, but in the 90's it starts to rain. 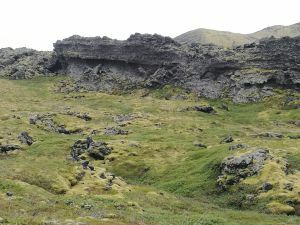 And from the fact that the climbs were weak and long, there are now ragging ramps from lava field to lava field. I've been done for long. Although it has been a quiet day, 100 km is not everyday. 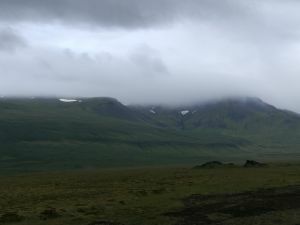 It was 17 when I left Olafsvik, now it is 21. Every time there is a climb, I think it must be the final one. Is it doubt whether the distance holds, or if I'm wrong? 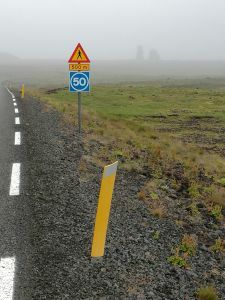 But FINALLY, just as the counter is reaching the 112km, I get up a climb and can look down at Arnarstapi - and down it goes. The place is completely out of the hemp. There is nothing but cold water and it is at the same time the most expensive I have yet met 2,000 kr. I know from a Pole I talk to and who stays there because he has a hurting knee. Otherwise he certainly had gone on.